In addition to releasing Mac OS X Lion 10.7.2, Apple also released iOS 5.0 for current model iPhone, iPad, and iPod touch devices and opened the virtual doors to the iCloud service. At the present time, the iOS 5.0 upgrade for my 16GB iPhone 3GS is taking about 45 minutes to download the 668.8MB update. I've been waiting a good 30 minutes now for the account verification email so I can start using the iCloud service. 10/13/11 12:20am - I just started the iOS 5 package download for the 4th Generation iPod touch. iTunes is reporting that the software update is pulling down in about 6 - 10 minutes. I think I'll actually run the upgrade tomorrow night. 10/13/11 12:05am - My iOS 5 upgrade on my iPad and data restoration is finally done and it's ready for me to test; which is code for "play with all the cool new features." 10/12/11 11:40pm - The iOS 5 upgrade completed some time ago on my iPad, but the data restore is taking forever. The bad news here is that iTunes is busy with the restore so I really can't work until the restore process has completed. 10/12/11 10:50pm - I figured I could short-circuit the upgrade process on my daughter's iPod touch 4th Generation by connecting it to my MacBook Pro while the iOS upgrade was running on my iPad; no such luck. Only one iOS device upgrade at a time - even if the only thing I wanted to do was get a jump on the iOS download package for the "iTouch". 10/12/11 10:25pm - Still another 25 minutes for the iOS 5 packaged for the iPad to be downloaded and installed. 10/12/11 9:52pm - The iOS 5 upgrade on my iPhone 3GS is complete. Next up, my iPad. 10/12/11 9:08pm - The iOS 5 update package for my iPhone 3GS has finally completed downloading. I'm about to start the software upgrade now. 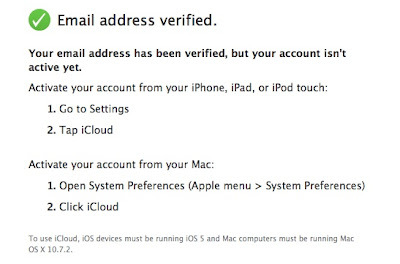 10/12/11 8:37pm - My iCloud account verification email has arrived. It took about 30 minutes for the request to be processed. 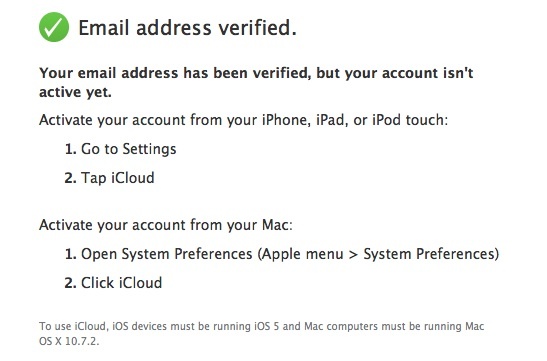 The email contains the directions for activating your iCloud account from an iOS 5 device or Mac OS X Lion 10.7.2. 10/12/11 8:30pm - The iOS 5 update package for my iPhone 3GS is still downloading. About 50% of the update is down, and iTunes is showing that another 53 minutes remains for the download before the update can be applied. It's going to be a long night. Again.